I am looking for a stuffed Zebra No. 768445 sold by Toys ‘R Us approximately 2 yrs ago (2008) made by Koala Baby brand. He is gray and white. My 2 year old nephew loves his ZEE and takes him everywhere. We are afraid what would happen if he was to lose it. He sleeps with it every night and cannot fall asleep without it! ..If it falls out of the bed, he is up screaming…for his ZEE. I would appreciate anything you could do to help me locate one! We have tried everywhere and are told even by the company who makes it that they are discontinued! 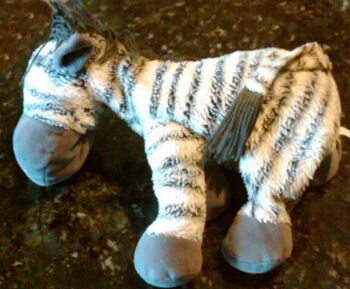 I am in the exact same situation with our exact same zebra (bought at BRU and has been with him for 3 years now, and was a gift for his first birthday) My sons zebra goes by the name Zeebee. We just had a major scare and Zeebee was lost for 48 hours and now found thankfully. But I too want to try to hunt down a back up. It looks like you have found one and if you have any tips for me I would greatly appreciate it. Thanks so much!